The success of DeKalb County Elections depends on individuals who serve as Election Judges who work as part of a team to ensure efficient, honest elections and guarantee the rights of voters are protected. There are certain times that we, as citizens, have an opportunity to make a positive impact on the democratic process and we invite you to join a distinguished group of men and women, who assure high quality elections in DeKalb County. Election Day Judges have been a staple in Polling Places from the beginning of DeKalb County Elections. We now have need for Early Voting, Early and Grace Voting, Election Day Registration and Vote by Mail Judges; each job is distinctly different, yet follow the same core principles and election laws. In the last several years High School students, throughout DeKalb County, have increasingly become involved as Judges on Election Day; it is a wonderful way for them to learn firsthand how our electoral process works. 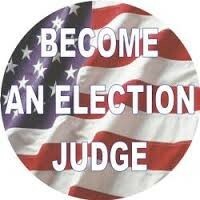 Please read the Election Judge Qualification sheet listed below with details required for the job. Please email, fax or mail the application to one of the addresses listed on the Application form. If you would like more in depth information please click on one of the tabs to the left: 1. Judge Program Information tab, 2. Training Information tab to view the next training dates and times and 3.Election Information & News tab for manuals, newsletters and publications. You may also contact Lynne Kunde, the Election Judge Coordinator, at 815-895-7183 or lkunde@dekalbcounty.org if you do not see your topic addressed on our site.